Watch me bring the classroom into the kitchen and see the science behind nutrient-based detoxification. It is also used to synthesize bile salts that are used for fat digestion so metabolizing cholesterol through the natural pathways of detoxification promotes more fat to be burned and metabolized. You can see why using only a nutrient-based Cleanse facilitates so much whole body relief. Not only does it promote weight loss but it has a positive impact. Let’s look at these healthy by-products of cholesterol metabolism and begin our journey into the science behind my 10-Day Fast Metabolism Cleanse. 1.) Glucocorticoids: Glucocorticoids: Weight gain is a side effect of glucocorticoid imbalance. These natural steroids regulate allergies, blood sugars, the immune system, insulin, fat cell proliferation, inflammation, and mood! When you are not metabolizing effectively, and your pathways of detoxification are not efficient an array of symptoms can persist. You can not fast to heal these pathways! They are nutrient-dependent. You must use whole foods and targeted micronutrients in order to rebalance if you have become toxic and your metabolism has become sluggish. 2.) Mineralocorticoids: Mineralocorticoid are manufactured from the cholesterol molecule and regulate a lot of the body structure, things like osteoporosis, osteopenia, also hypertension and sodium-potassium balance in the body. The mineralocorticoids are those hormones that regulate whether you produce nice lean muscle and tight collagen. In this program, I am trying to facilitate helpful nutrient-based rapid weight loss, so I wanted to really infuse this program with things that worked on the mineralocorticoids. 3.) Estrogens and the Metabolites: Your estrogen levels can reveal if a hormone imbalance can be causing some of your symptoms. Ideally, we look at the different forms of estrogen: estradiol, estriol, and estrone. Estradiol is the one most doctors like to monitor. With excessive midsection weight gain or in postmenopausal women, I look at estrone because estrone production isn’t just limited to the ovaries. It can be stimulated by fat cells and the adrenal glands and can be related to stress-related weight gain. If you have extra body fat, compensatory hormones are also being created by your fat cells. The more fat you have, the more hormones will be produced, and they may not be able to be used, creating excessive amounts in the blood, typically of estrogen (even in men). This can interfere with weight, mood, behavior and many aspects of metabolic function. 4.) Progesterone and the Metabolites: This hormone is produced mainly in the ovaries and works in concert with estrogen to balance the hormonal cycle. Progesterone levels rise and fall on a monthly basis. 5.) Testosterone and the Metabolites: Knowing your numbers empowers you to see one important picture of your current health condition and do something about it. When your numbers are off, when your metabolism is suppressed, change your diet first! The better you care for yourself, and the healthier your metabolism, the more reliable your body’s systems will be for detoxifying, eliminating, burning fat, maintain a healthy body weight, finding healthy hormone balance, and preventing disease. Vitamin D, there is more written about the health benefits of this nutrient than possibly any other. The key take away is this: If you are diagnosed with a Vitamin D deficiency we need to ask why. When the body is efficiently detoxifying, we should be able to manufacture our own. We can supplement for the imbalance to help promote health, but the ultimate goal should be to heal the pathways of metabolic detoxification! Support the adrenal glands, which regulate stress hormones, by eating nutrient-dense carbs and fruit. 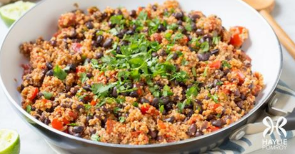 Keep the blood sugar stable with a steady stream of protein. Always eat within 30 minutes of waking, digestion promotes detoxification. Eat every two to four hours, and have one to three healthy bowel movements per day. Participate in our next 10-Day Fast Metabolism Cleanse Challenge and save big on the Cleanse Bundle that is 20% off right now! (Members receive an extra 10% off) + FREE US Ground Shipping! It is important when you are promoting detoxification to eat anything—and I do mean anything—rather than not eating at all. But obviously, eating something nutrient-rich and supportive is the ideal. It is the micronutrients that facilitate detoxification and promote a Fast Metabolism. Do NOT fast. Are ready to be inspired, motivated and guided to health! Stress hormones inhibit your bodies natural ability to detox. 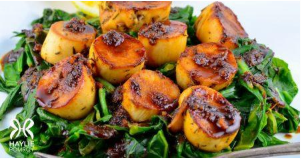 Our Seared “Scallops” Over Spicy Collard Greens & One-Pan Mexican Quinoa, click on the pictures to get the recipes!